Paul Johannes Tillich (August 20, 1886 – October 22, 1965) was a German-American theologian and Christian existentialist philosopher. Tillich was one of the most influential Protestant theologians in the twentieth century. Paul Tillich appeared on the scene at the beginning of the twentieth century, a time when Europe was going through considerable upheaval, politically and spiritually. The relevance of Christian teachings to modern life was being challenged, and so was the optimism of science and liberalism inherited from the nineteenth century. In post-World War I Germany, when Tillich made his first significant contributions, the situation was particularly dramatic. Among the great theologians of the twentieth century, Tillich was perhaps the one with the widest horizon. His approach was interdisciplinary and interreligious. It was also historical. He believed that the tragic situation of contemporary civilization was a great opportunity for realizing the goal of religion in concrete life. For this, he felt the religious dimension had to permeate the secular sphere, neither of the two being able to survive meaningfully without the other. He believed that such a time of fulfillment had come when Jesus was on earth, and that a similar opportunity was coming to Europe after World War I.
Tillich’s experience in the trenches as a chaplain in World War I led him to the study of Nietzsche and his critical thought about Christianity, which Tillich thought needed to be addressed with philosophical credibility. This experience formed the basis of his philosophical life in a way analogous to Luther's so-called "tower experience." Throughout his life, Tillich strove to show how apparently godless authors and systems could approach the Ultimate more genuinely than conventional Christianity. The main thrust of Tillich’s thought was to recreate a meaningful link between Christianity and contemporary society. Like Karl Barth, he intended to do so by reintroducing the absoluteness of God and the Christian message, as opposed to its attempted “enculturation” in the liberal Protestantism of that time. That attempt, Tillich and Barth felt, was doomed to fail, as it deprived Christianity of its very essence. Like Barth, Tillich also linked the Christian message to social justice and the socialist movement. Unlike Barth, however, Tillich did not believe that a mere insistence on the absoluteness of faith in God as the “wholly other” was a viable solution. He strongly felt that ways had to be sought to show how religion was a necessary dimension of any society and how the absolute God was at the same time present in all relative cultural life. Though Tillich’s emphasis and his style would change over time, particularly after his exile to the United States in 1933, he always maintained his passion for connecting the two sides of any issue or situation. This is well expressed in his 1936 autobiography, On the Boundary, where Tillich relates how his life has been straddling the limits between theology and philosophy, the church and society, Europe and America, Protestantism and Catholicism, liberalism and neo-orthodoxy, and so on. For Tillich, this position on the border was not painful or unpleasant. He perceived it as a destiny that was in accordance with his personal disposition. Born in Starzeddel (in what is now Poland) as the son of a Lutheran pastor, Tillich studied at the universities of Berlin, Tübingen, Halle, and [[Breslau]. He received his doctorate in philosophy in 1910 (Breslau) and his licentiate in theology in 1912 (Halle). Shortly thereafter, in 1912, Tillich was ordained minister in the Lutheran Church. He served as chaplain in the German army during World War I, an experience that left a profound mark on him and contributed to his future orientation. In 1919, he took up a teaching career that would last until the advent of Nazism. Tillich taught theology at the universities of Berlin, Marburg, Dresden, and Leipzig, and philosophy at Frankfurt. However, his opposition to the Nazis, his social positions, and his solidarity with Jews would cost him his job. He was one of the first German professors to be fired for his positions in 1933. Tillich then accepted an invitation from Reinhold Niebuhr to teach at the Union Theological Seminary in the United States, where he emigrated later that year. Tillich became a U.S. citizen in 1940. It is at the Union Theological Seminary that Tillich earned his reputation, publishing a series of books that outlined his particular synthesis of Protestant Christian theology with existentialist philosophy (drawing on research in psychology in the process). Between 1952 and 1954, Tillich gave the Gifford lectures at the University of Aberdeen, which resulted in the comprehensive three-volume Systematic Theology. A 1952 book outlining many of his views on existentialism, The Courage to Be, proved popular even outside philosophical and religious circles, earning him considerable acclaim and influence. These works led to an appointment at Harvard University in 1954, where he wrote another popularly acclaimed book, Dynamics of Faith (1957). He was also a very important contributor to modern just war thought. In 1962, he moved to the University of Chicago, where he continued until his death in Chicago in 1965. Tillich's ashes were interred in 1965 in the Paul Tillich Park in New Harmony, Indiana. Tillich’s work is clearly divided into his early German period and his later American period. In spite of significance differences on the surface, there is, however, great continuity in his positions. The early German Tillich was primarily focused on issues relating to the philosophy of religion, as well as social issues and the question of Christian socialism. Later, he would remember the “German provincialism” of his early years. However, in spite of the academic language filled with cumbersome expressions, his early works perhaps represent his most original contribution. Certainly, they contain the key themes that he would develop throughout his life. For Tillich, human existence, that of a finite being, inevitably means an alienation from Being. In stark contrast to traditional Christian doctrine, Tillich actually understood the human fall from grace as being the very coming into existence of humankind, its creation as a limited being. However, there are moments in history, Tillich believed, where the divine breaks through into human existence and realizes itself, albeit never perfectly. Such a time he calls Kairos, a Greek word for “right time,” as opposed to simple chronological time. This happened with the advent of Christ two thousand years ago. But Tillich believed that such a time of Kairos had returned in Germany at the end of World War I, the only other time in history he ever identified as such. Then, he believed, the opportunity had appeared for Christian socialism to be established. Though Tillich showed sympathy for Marxian themes, he nevertheless remained critical of Marxism. To him, socialism meant the establishment of a just society, where the limitations of being’s concrete realization could be transcended and capitalistic materialism overcome. In many ways, this vision corresponds to that of the Kingdom of Heaven on earth. Tillich’s book, The Socialist Decision, was burned by the Nazis. During the American period, Tillich’s emphasis on the socialist utopia faded, but he never abandoned his criticism of what he perceived to be capitalism’s materialistic idolatry. Tillich’s most important contribution during his early years was in the philosophy of religion. Initially, he had been influenced by Schelling’s speculative mysticism and attempts to unify theology and philosophy. But, based on Kant’s critical method, Tillich soon concluded that there was something fundamentally wrong in considering that God could be grasped as a limited object of thought. Rather, he felt, God had to be found in the immediate apprehension of the human mind. Kant had understood that reality is what it is in our experience, but he had not properly accounted for the specific character of the religious experience. The religious element, Tillich concluded, consisted in the immediate and “unconditioned” meeting of our thinking mind with Being. This meeting with Being is the absolute limit of thinking. Being can only be apprehended through a mystical experience, in other words through intuition. Hence, what Tillich called his critical-intuitive (later “metalogical”) method for apprehending the religious as a category of its own. The being that is met in this process is “unconditioned,” i.e., it is absolute, not conditioned by anything, simply there. Following Rudolf Otto, Tillich saw Being as both terrifying (a challenge to the autonomy of our thought) and attractive (giving fulfillment mere thought cannot provide). In his philosophical apprehension of God, Tillich used the word Unconditioned to avoid objectifying God. Later, he would prefer ultimate concern, referring to a mere function of our mind, and thus even more removed from the dangers of objectification. Karl Barth strongly disliked the expression “unconditioned” and referred to it as a “frozen monstrosity.” One must understand that through it, Tillich tried to isolate the very element that makes the ultimate, God, what it is, regardless of external identification with a belief. As a result, Tillich extended what he called religious belief to any sense of the “Unconditioned,” be it religious in the traditional sense or not. For him, religion thus was primarily not a particular domain that might or might not find its place in our society. It was the fundamental dimension of every life experience. Even a materialist atomist finds in the atom the absolute ultimate of reality. In this sense, he is a believer. And the atheist believes that there is “absolutely” no God, hence he is religious in his own way. The strength of this approach is that it is very inclusive; it frees religion from its ghetto and universalizes it. Its weakness is that it becomes somewhat unclear how a “genuine” religious experience can be distinguished from other forms and how God’s being can be more than our human horizon. Tillich has attempted to clarify these points in his theological writings, but there is widespread agreement that some inconsistency remains. In the second part of his career, beginning with his coming to the United States in 1933, Tillich moved away from his earlier emphasis on the philosophy of religion and his focus became more properly theological, with inputs from a variety of other fields. But Tillich’s approach and his discussion of themes remained very philosophical for a theologian and his earlier insights constantly reappear in the discussion. The relationship between the two poles of his interest in ultimate truth is symbolized by his so-called “method of correlation,” by which he intends to have theology answer questions raised by philosophy and culture. Tillich sought to correlate culture and faith such that "faith need not be unacceptable to contemporary culture and contemporary culture need not be unacceptable to faith". As a consequence, Tillich's orientation is highly apologetic, seeking to make concrete theological answers such that they become applicable to an ordinary day's course of events. This contributed to his popularity by the virtue of the fact that it made him accessible to lay readers. In a broader perspective, revelation is understood as the fountainhead of religion. Tillich sought to reconcile revelation and reason by arguing that revelation never runs counter to reason. However, for him, the two stand in a paradoxical relationship to each other, one that can never be permanently stabilized. Tillich’s approach can also be called existentialist. In his early years already, his approach of God as the Unconditioned was related to an existential analysis. Tillich immediately felt a profound affinity for Heidegger’s position after he discovered it in Sein und Zeit (Being and Time, 1927), in spite of Heidegger’s atheism. He argued that anxiety of non-being (existential anguish) is inherent in the experience of being itself. Put simply, people are afraid of their own non-existence, i.e., their death. Following a line that was also related to Kierkegaard and Freud, Tillich says that in our most introspective moments we face the terror of our own nothingness. That is, we "realize our mortality" that we are finite beings. What can sustain finite beings is being itself, or the "ground of being." This Tillich identifies as God. Another name for the ground of being is essence. Essence is thought of as the power of being, and is forever unassailable by the conscious mind. As such it remains beyond the realm of thought, preserving the need for revelation in the Christian tradition. Tillich’s mature view of theology is expressed in the three volumes of his Systematic Theology. For him, Christ is the "New Being," who rectifies in himself the alienation between essence and existence. Essence fully shows itself within Christ, but Christ is also a finite man. This indicates, for Tillich, a revolution in the very nature of being. The gap is healed and essence can now be found within existence. Thus for Tillich, Christ is not God himself, but Christ is the revelation of God. Whereas traditional Christianity regards Christ as a wholly alien kind of being, Tillich believed that Christ was the emblem of the highest goal of man, what God wants men to become. Thus to be a Christian is to make oneself progressively "Christ-like," a very possible goal in Tillich's eyes. In other words, Christ is not God in the traditional sense, but reveals the essence inherent in all existence. Thus Christ is not different than mankind except insofar as he fully reveals God within his own finitude, something that can also be done in principle. In the third and last volume, Tillich expresses his view of “Life in the Spirit” and the “Kingdom of God,” which are closely related to his notion of Kairos, or God’s time. For him, Spirit is a "depth dimension" of life (where the absolute resides) that is accessed transparently on occasion through theonomous experiences. The work of the Spirit does not break the existing structures but heals them. According to Tillich himself, this achievement remains by necessity fragmentary with a view towards an eschatological fulfillment. Since things in existence are corrupt and therefore ambiguous, no finite thing can be (by itself) that which is infinite. All that is possible is for the finite to be a vehicle for revealing the infinite, but the two can never be confused. Tillich speaks of the demonic temptation that consists for the finite to make a claim to unconditioned finality for itself. This applies to all forms of church life as culture, and it leaves religion itself in a place where it cannot be taken as too dogmatic because of its conceptual and therefore finite and corrupt nature. True religion is that which correctly reveals the infinite, but no religion can ever do so in any way other than through metaphor and symbol. Its view of the ultimate can never be ultimate itself. Tillich called this the “Protestant Principle,” according to which every “yes” (affirmation) had to be counterbalanced by a “no.” Thus the whole of the Bible must be understood symbolically and all spiritual and theological knowledge cannot be other than symbol. This is often seized upon by theologians to utilize as an effective counterpoint to religious fundamentalism. Among all symbols, Tillich felt that the cross was the least susceptible to be used in an abusive way, since it represents self-denial itself. Tillich constantly refers to three forms of relationship between the Church and culture or society: theonomy, autonomy, and heteronomy. Theonomy is the state where religion consists of an authentic meeting of the mind with God, something that pervades society from the inside and gives it its life and even its structure. Hence the word theonomy (God’s rule). Theonomy characterized the early middle-ages. In the late middle-ages, theonomy gradually turned into heteronomy, the least desirable of the three: religion is imposed from the outside (the meaning of heteros) and becomes oppressive. Later still, with the advent of modernism, autonomy came to dominate society, representing the independence of the human mind from any external authority. Tillich believed that autonomy has its legitimate place in society, but that it can do so only within a framework of theonomy, something that has been missing for centuries. Based on his premises, Tillich felt that God, the Unconditioned, could be met in and through any religious (or not strictly religious) paradigm. Though his approach was clearly that of a Christian, and not a neutral, undifferentiated one, he made it unambiguously clear that a similar approach could be developed based on other religious traditions. Later in life, he had the opportunity to visit Japan and to meet Japanese representatives of Zen Buddhism. Their dialogue did not prove particularly conclusive and Tillich maintained a certain distance. Still, elective affinities appeared based on the notion of the “non-existence” of God. As a theologian (namely in his “Systematic Theology”), Tillich came to make the paradoxical statement that God does not exist, for which he has been accused of atheism. "God does not exist. He is being itself beyond essence and existence. Therefore to argue that God exists is to deny him." That statement is a continuation of Tillich’s earlier conclusion that God cannot be conceived as an object, no matter how lofty. We cannot think of God as a being that exists in time and space, because that constrains Him, and makes Him finite. Thus we must think of God as beyond being, above finitude and limitation, the power or essence of being itself. There is a clear logic in Tillich’s development here, and he makes it plain that denying God’s “existence” is in fact needed in order to affirm him. Still, at times he makes it hard to avoid the impression that there simply “is” no God, which is largely due to his use of the notion of existence. Again, the apologetic nature of Tillich’s discourse should be remembered. The purpose of such statements is to forcibly remove incorrect notions from the minds of his audience by creating a state of shock. For more on this topic, see Robert R.N. Ross’s The Non-Existence of God: Linguistic Paradox in Tillich’s Thought (1978). 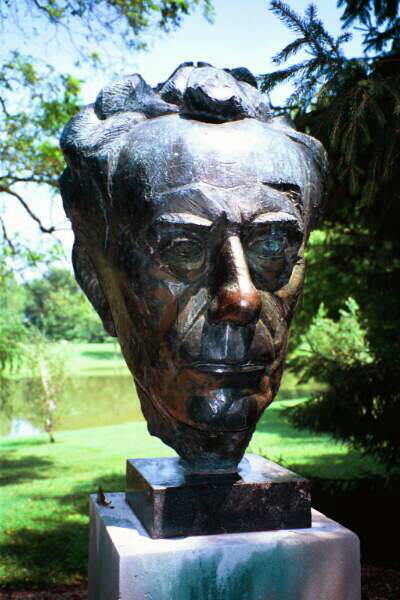 James Rosati's sculpture of Tillich's head in the Paul Tillich Park in New Harmony, Indiana. Paul Tillich memorial stone in the Paul Tillich Park in New Harmony, Indiana. This page was last modified on 30 January 2019, at 17:33.